Contrast photos always look more expressive and professional. The technique of high contrast that can be achieved with contrast Lightroom presets always makes a picture more dramatic, emphasizing all visible details more strongly. Whether it is a color photography or black and white picture, as the range of bonuses after presets Lightroom high contrast free is wide. In order to prove the idea of flexibility and universality of presets Lightroom contrast, some photo examples should be considered. The photo on which bright sunlight, breaking through the trunks of trees in the autumn forest at dawn is captured is a good example. For such photography these top Lightroom presets will be effective. Or there is another example when a bright sky photographed in contrast to a dark forest. Such pictures are always attractive and beautiful, but with modern high contrast Lightroom preset the result will be better and more professional. Photographers no longer need to experiment with the settings having a question how to use Lightroom presets, as their application is simple and fast. They just use the best free Lightroom presets and after several clicks admire the result. While trying photo post processing without professional support, photographers may not be able to do anything. Too great value of photo contrast between some parts of the frame leads to the fact that either the bright areas turn out to be well-designed, while others are characterized by a lack of detail in the shadows. Using our presets Lightroom contrast, you will not encounter such problems and will be able to achieve high-quality results without much efforts. With Lightroom presets high contrast is added easily. Frequently presets Lightroom contrast are applied to get a “clean edit”. That is a type of photo retouching that makes picture as if they just came from a camera, but at the same way it is considerably improved. The simplicity lies in the fact that with rightly chosen high contrast Lightroom preset you will be able to enhance photography adding different options. Adobe Lr Preset Free #1 "Soft"
The main peculiarity of these contrast Lightroom presets is that they desaturate retouched photos and add more contrast to them. With such presets Lightroom high contrast free can be achieved professionally, as they add warm tones to light photo parts and add cool blue tones to dark parts. 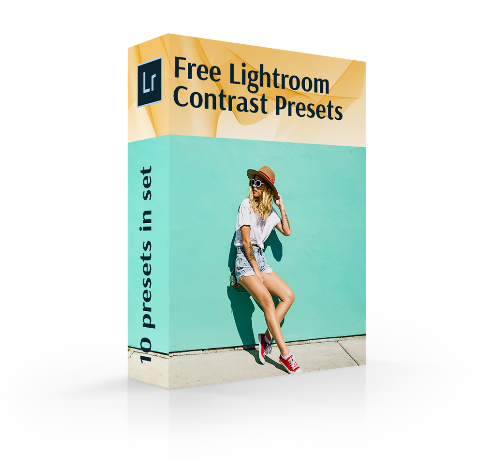 Preset Lr High Contrast Free #2 "Portrait"
This Lightroom preset contrast has a big number of options, as it increases brightness and photo exposure in combination with adding contrast, warmth and vibrancy. It also adds portrait sharpening and vignette. In result retouchers get bright versions of photography that is underexposed. Contrast Lightroom Preset #3 "Hard"
The mentioned high contrast Lightroom preset gives photos charm by increasing contrast and brightness. It brings back dim photos. For this it suits well for retouching street shots and is in the list of street photography Lightroom presets. High Contrast Lightroom Preset #4 "Stylish"
These presets Lightroom contrast are common and simple. They act in two directions – adding contrast and brightness. They are effective in increasing warm colors. They are frequently used in reportage photography for achieving realistic effect. Free Lr Preset High Contrast #5 "Matte"
It is in the list of the most chosen presets Lightroom contrast. It augments contrast and makes a picture desaturated. It is applied to fill all parts with dim colors to make a photo professionally enhanced. Preset Lightroom Contrast #6 "Saturation"
For sharp photography this Lightroom preset contrast suits the best. The main idea of the high contrast Lightroom preset is lowering saturation and providing split toning. Retouchers frequently use such plugins, because they add soft and little cold colors that makes photos noticeable. Preset Lightroom High Contrast #7 "Cool"
The next contrast Lightroom presets increase contrast by blurring light shades. These presets do not suit for images of the night sky. But for well-lit landscapes they give a zest. In close-up portraits, such presets Lightroom contrast help to emphasize the whole look. Lightroom Preset High Contrast #8 "Brighten"
The following Lightroom presets high contrast add graininess and a bit grungy look to photos with making their colors warm and contrast. Such presets have power to make RAW photos professionally retouched, as if after a hand of an expert. Free High Contrast Lr Preset #9 "Darken"
With the next contrast Lightroom presets brightness and contrast are in the focus of attention. The peculiarity is that such presets with free Lightroom brushes add glossy effect to retouched photography. This effect is able to transform photos of any styles. Free Lightroom Preset #10 "Sharpen"
The last contrast Lightroom presets are free for using as all previously mentioned. They make pictures brighter. After their application photo shadows seem to be a little washed out. In case you need to add curve or exposure to choose such presets Lightroom contrast will be a professional decision. In case you are a photographer that prefers to photograph in RAW, meaning that instead of JPG file format your choice is RAW, then the situation during which you get “blah” pictures must be familiar to you. Raw photos are usually deprived of effectual noise reduction, sharpening, extra necessary colors and contrast. All these featured are added when a file is converted into JPG. Photographers have to add all mentioned things during photo post processing with the help of the best Lightroom brushes and other techniques. The most important in such RAW photos is adjusting right contrast. In case you are not familiar with Lightroom adjustment brush presets, there are four the most used ways of adding contrast. All of them adjust the right level of contrast to the whole photography at once, but not only to its parts. Usually photographers use only one way, but according to retouching purposes, a combination of two or even more ways can be in application. The only warning is not to overdo, meaning not to add too much contrast. The most professional is always a fine balance and after using presented contrast Lightroom presets you will understand it. In the section Contrast it is necessary to move slider to the right side. That will add contrast, to make it lower move the slider to the left. In the section Black in order to add contrast retouchers move slider again to the right. Most of contemporary retouchers do not use the first two variants frequently, because the achieved effect is not as expected. Every Lightroom preset contrast is easier in this way. Tone and Curve sections are the most chosen. In the first case, retouchers choose between strong and medium points. The most qualified ones create a curve, as that helps to adjust contrast in the most professional way. Our experts in Lightroom editing techniques have created all mentioned plugins for fast and effective photo retouching. Every Lightroom preset contrast is suitable for a particular type of photography simultaneously being universal. Download these plugins and simplify your photo post production procedure.